I ordered and received my Silhouette Cameo almost a month ago. It his been so hectic at our house over the last month, I haven't been able to do more than just play with the software and cut some practice things out of some old scrapbook paper I had left over from some other projects. This is my first real project I've been able to do. We love our dogs and one of the ways we have shown them love over the years is through dog biscuits. 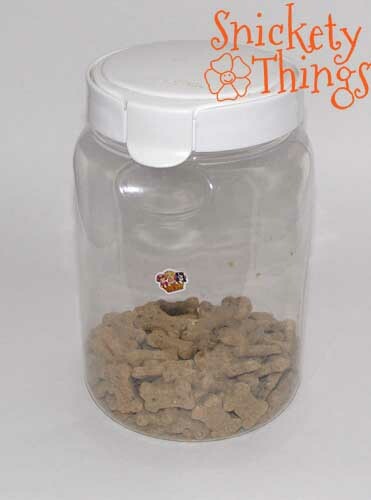 We got the dogs eight years ago, and shortly after we bought this treat jar to store the biscuits. It stayed pretty plain until around six months ago when Boo decided to put a little sticker on the front to show it was for the dogs. I decided to make something for it with my Silhouette. I had the opportunity to upgrade to the designer software recently with a special giving me half off over at Craftaholics Anonymous. 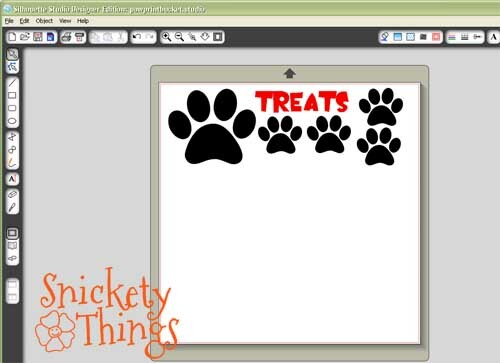 I was able to import a SVG file of a paw print I had. I also wrote out the word "TREATS" in Oogie Boogie. I also made a few smaller prints that I am going to use on another project soon. I cut it out of some white Paper Studio vinyl I already had from some other projects. I just had to buy a roll of transfer paper at Hobby Lobby with the gift card my mother-in-law gave me for my birthday. It is hard to see on the backing paper, but here is everything cut out. I cut a strip of transfer paper and put it on this, then cut out each individual item I wanted cut. I thought that would be easier than trying to cut a piece of transfer paper to cover each shape after they had been cut apart. 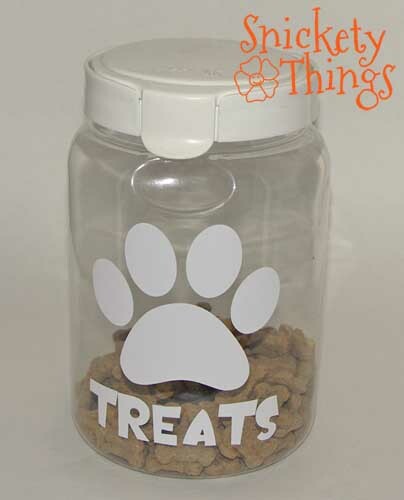 Then I just applied them to the treat jar using the transfer paper. What do you think? The girls thought it looked great, but Boo was a little disappointed her sticker was removed first. The dogs really didn't have an opinion, but they did get a treat out of the deal. I've also been playing with my light box. 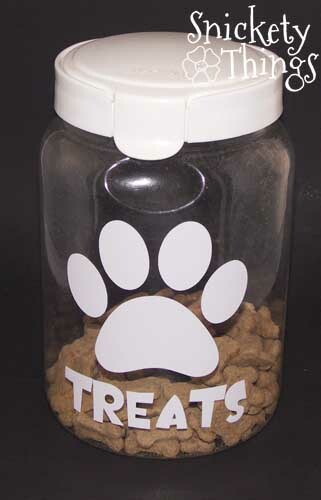 Here is the treat jar on the black background I made for it. 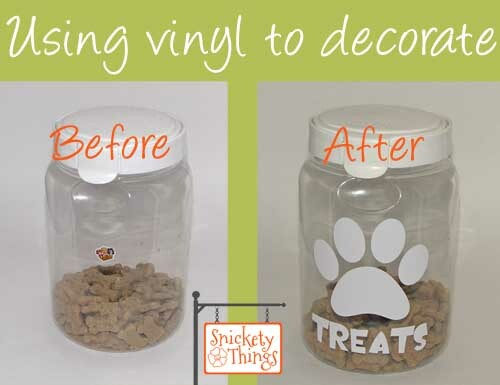 I can't wait to show you my other project with the smaller paw prints. It will be a few more weeks at least before I can show you though. I can't wait to do more projects! Visiting from the Crafty Soiree Party. Your blog layout/ design is super cute just like this project!